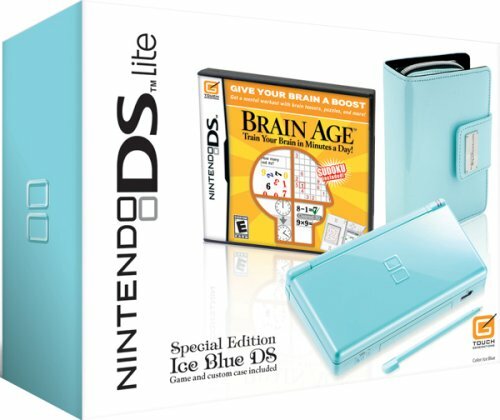 Included in this limited edition bundle is an Ice Blue Nintendo DS Lite, a carrying case, and the Brain Age: Train Your Brain in Minutes a Day! game. A little about Brain Age: Train Your Brain in Minutes a Day! - Inspired by research conducted by Professor Ryuta Kawashima, a prominent Japanese neuroscientist, comes Brain Age: Train Your Brain in Minutes a Day!? Professor Ryuta Kawashima's theories revolve around keeping your brain ¡°young¡± by performing certain mental activities quickly through a series of minigames.? Activities include performing simple math problems, counting people going in and out of a house, drawing pictures on the Touch Screen, and reading classic literature out loud.? When you start a new game, you will take a series of tests and get a score that shows your ¡°DS Brain Age."? As you use the software, your in-game Brain Age will drop. You can keep up to four save files on one Game Card ¨C sharing a game allows you to compare your results with those of family and friends.? You can also send a demo version of the title to friends or compete with up to 16 players in a battle to see who can solve math problems the fastest! (Both downloadable modes are local wireless only, not on the Nintendo Wi-Fi Connection). With Nintendo DS Lite, dual screens and touch-screen technology allow you to interact with games like never before. Wireless communication allows you to experience real-time multiplayer gameplay, and the free Nintendo Wi-Fi Connection service allows you to compete against players from around the globe. Lighter. Brighter. With dual screens, a touch screen, wireless gameplay and more. Double the fun with two screens. Two incredibly bright LCD screens offer one of the most groundbreaking gameplay advances ever developed. Each 3-inch screen can reproduce a true 3D view, with impressive 3D renderings that can surpass images displayed on the Nintendo 64. Ready to take on the world? Now, with Nintendo Wi-Fi Connection, you can connect wirelessly, chat and play with Nintendo DS owners across the globe. All you need to play is a Nintendo DS and a Wi-Fi-ready game. There are no subscription fees -- the service is free! A built-in microphone port means that with Nintendo DS, you only need to tell your games what to do. The Nintendo DS microphone gives you even more ways to interact with your favorite games. With Nintendo DS Lite, you can connect with a local wireless network of up to 16 players. The wireless range can be an incredible 30 to 100 feet and for some games, multiplayer requires just one Nintendo DS game card. Note: Nintendo DS Lite wireless communication, including PictoChat, is not private and is not monitored by Nintendo. We recommend that you never reveal any personal information or arrange to meet a stranger. Nintendo DS Lite sound capabilities allow for greatly expanded use of voices and music, and a richer, more immersive game experience. Stereo speakers allow for virtual surround sound and a plug for headphones transmits stereo sound. Nintendo DS Lite features a separate media port for Game Boy Advance cartridges, allowing you to play all your favorite Game Boy Advance games in single-player mode. A Touch Screen means you no longer have to rely on just buttons. Size (closed): 133 millimeters (5.2 inches) wide, 73.9 millimeters (2.9 inches) long, 21.5 millimeters (0.85 inches) tall. Top Screen: A backlit, 3-inch, transmissive TFT color LCD with 256 x 192 pixel resolution and .24 mm dot pitch, capable of displaying 260,000 colors. Wireless Communication: IEEE 802.11 and Nintendo¡¯s proprietary format; wireless range is 30 to 100 feet, depending on circumstances; multiple users can play multiplayer games using just one DS game card. Controls: Touch screen, embedded microphone for voice recognition, A/B/X/Y face buttons, plus control pad, L/R shoulder buttons, Start and Select buttons. The stylus is 1 centimeter longer and 2 millimeters thicker than the stylus of the original Nintendo DS. Input/Output: Ports for both Nintendo DS game cards and Game Boy Advance game paks, terminals for stereo headphones and microphone. A removable cover for the Game Boy Advance game pak slot provides added protection from dust and other foreign materials. Other Features: Embedded PictoChat software that allows up to 16 users within local range of one another to chat at once; embedded real-time clock; date, time and alarm; touch-screen calibration. CPUs: One ARM9 and one ARM7. Battery: Lithium ion battery delivering five to 19 hours of play on a four-hour charge, depending on use; power-saving sleep mode; AC adapter. Languages: English, Japanese, Spanish, French, German, Italian. Great Game for the "older generation"
i bought this package for my wife for christmas and it was a huge hit! she had no idea, and fell in love with the brain challenges and sudoku. I bought the package in lieu of dealing with the hordes on black friday and the retail stores. it was the exact same package and price and i bought it early. Great DS game that came with is ok not the best though! At first I didn't like the idea of the ice blue color and the bulky looking carrying case, but one I started buying additional games and misplacing my stylus, and shopping for other carrying cases I realized how handy the case was and the color. Also the case is very feminine looking and have received a lot of compliments on the case from people not realizing that it housed a game system. It fits comfortably in my 'between small and medium sized' pocket book. I already knew that I like Brain Age 2 because my coworker brought hers when we went away for 3 weeks of training. I got addicted. I was afraid to get the bundle because I thought that Brain Age 2 had some of the same activities as Brain Age 1 and I knew I wanted to purchase Brain Age 2. But to my surprise the exercises were totally different. I love this bundle and love both Brain Age games and use them frequently; along with Flash Focus (which is better and more fund than I imagined it would be). Even though these can be somewhat addictive, the game actually only records each activity 1 time per day so that you don't spend so much time trying to perfect a score or time on an activity. So you literally spend a few minutes a day (no more than an hour on all three games) to improve skills you may need anyway. Then they both have Sudoku. That is a whole other story. Very time consuming and addictive to solve puzzles and beat your own time to complete the puzzle. No complaints here!! If you miss Dr. Mario then that surprise will make you happy in Brain Age 2!! I can't find this in the stores. I bought this DS and game bundle for my daughter. At first she seems not interested in the game but the more she played the more fun she has. Now she is asking for more Brain game like this one. About the game console : the screen is very clear and bright. This package is the best holiday gift for my daughter so far and price is reasonable. I thought my brain ran fairly well. Brain Age tells me I am wrong. It has been great fun getting my Brain Age to be my actual age.